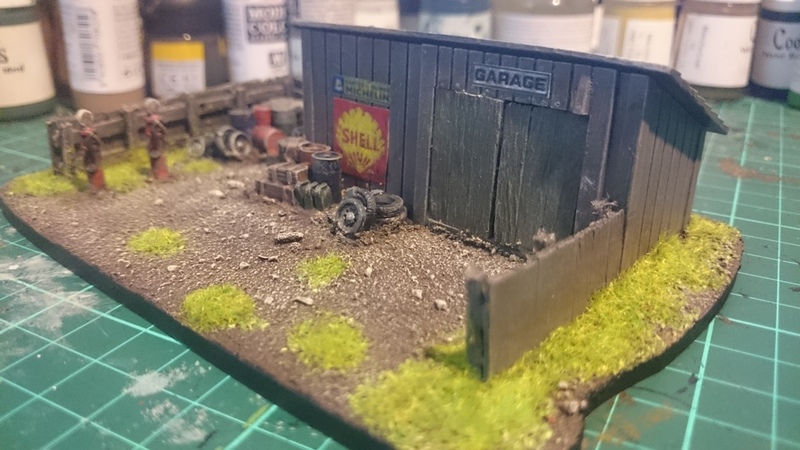 You may remember last week I wrote a blog post about repurposing some old toy farm buildings as 15mm wargaming scenery. The Oil Drums and boxes are again from the Baeuda Battlefield Accessories pack, the Petrol Pumps and Tyres are from Peter Pig. The fencing is scratch built from every scenery builders second favourite material: the Mk 1 coffee stirrer! The bases for these models are from Warbases. I must say that you are rather good at producing very nice pieces of scenery and buildings. In all seriousness, I am really pleased with how the garage turned out – I think it is probably the best piece I have done so far. Looks great and realistic, splendid details! Brilliant, especially the details on the garage! Terrífic work, how did you do the wood finish? Also, I can’t claim credit for the wood grain effects on the buildings themselves – these are actually cast in the plastic, but weren’t apparent until they had been washed and drybrushed. Those are really good. Amazing transformation. I second this, the transformation into some beautiful wargaming terrain is remarkable. Very well done and the addition of all the details adds even more awesomeness!